Forget birds and bling—it’s yolks for Portland folks. In the city that helped cement the phrase “urban chickens” in our modern lexicon, it comes as no surprise that we’re tossing eggs on top of pretty much everything we eat. These protein powerhouses may be packed with nutrients and silly cheap, but local chefs are actually using them to lend a sunny-side up-scale twist to seemingly mundane dishes like pizza or burgers. 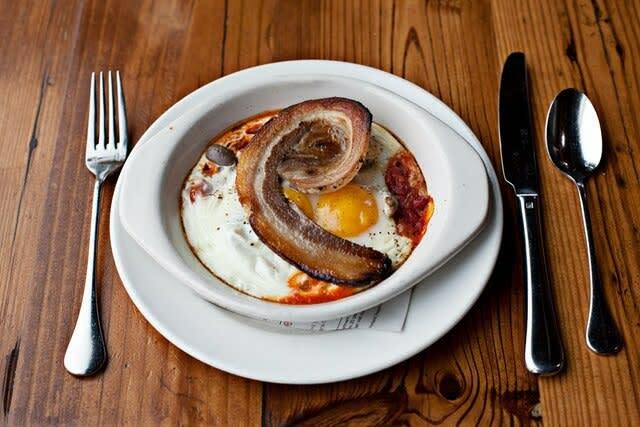 The new eatery from chef Jenn Louis, Sunshine Tavern (3111 SE Division St), debuted last night and on the menu is one of the repeated James Beard award nominee’s favorite concoctions—baked eggs. In this version (she also has one at Lincoln with cream, olives, and breadcrumbs), an herby tomato sauce provides the base for two just-cooked eggs and thick slices of pancetta. It’s a tangy, salty, light-and-yet-filling treat. Even the Wall Street Journal had to have it. I know it skeeves some people out, but I’m a big fan of plopping an egg on a pie—it’s cracked over the top and allowed to bake just long enough to crisp up on the sides but retain all its runny, liquid-gold goodness. When you pop the yolk, you get a salty, savory sauce in which to dunk your crust. You can add an egg to any pizza at Lovely’s Fifty-Fifty for only $2. Right now I’d suggest trying it on the mixed rapini with calabrian chilies & young pecorino or salumi finocchiona with mama lil’s peppers & green olives. Keep your pizza pristine but retain the egg-dipping option by ordering the spinach, radish, and soft boiled egg salad with house ranch at Tastebud. A textural playground, it’s a simple but flavorful, hefty, and unique way to get your greens. Another tasty option is St Honoré’s version of a Salade Lyonnaise—it tops bacon, sauccisson à l’ail, roma tomatoes, toasted croutons, and house vinaigrette with a perfectly poached egg. St. Jack has a traditional rendering of that same salad, which puts the egg atop frisée, bacon lardons, and bacon fat croutons. Either way, the result is a rich, meaty, sharp, sour, and creamy dream. Both the udon and the ramen at Biwa come with half a just-barely-hard-boiled shoyu egg (they’re boiled in soy sauce) that somehow manages to retain its yolk integrity despite the piping hot broth. In all honesty, the egg’s flavor is a little lost in both these soups, but it adds a punch of protein and sunny color to the thick wheat noodles, greens, and minimal tofu in the vegetarian udon, and range to the pork and chicken ramen. If you’re feeling more adventurous, head over to BeWon on NW 23rd and try the soon dubu—a hot and spicy soft-tofu stew that gets a raw egg topping as the bubbling bowl hits your table. A lot of burger aficionados seem to prefer their patties with as few accessories as possible. I disagree. When you’re truly hungry, nothing beats a Foster Burger piled high with a buttery fried farm egg, medium cheddar, roasted jalapeños, sautéed onions, and pickled beets. It’s a gut-busting gourmet smile on a brioche bun. Besaw’s and Killer Burger do it too. I’ve been to DOC twice in recent weeks, each time with an army of carnivores. Much to my surprise, both times everyone at the table agreed that their favorite dish was the wild nettle & Oregon truffle lasagna topped with a soft farm egg—earthy and decadent, it’s a truly elegant rendition of an old standard. Over at Lincoln you’ll find those same nettles in the stirred risotto, but this time with purgatorio beans and a poached duck egg. That cracked quacker turns a dish I often find ho-hum into something that’s a nuanced hit. Where else do you think the afternoon or evening eggs have legs?